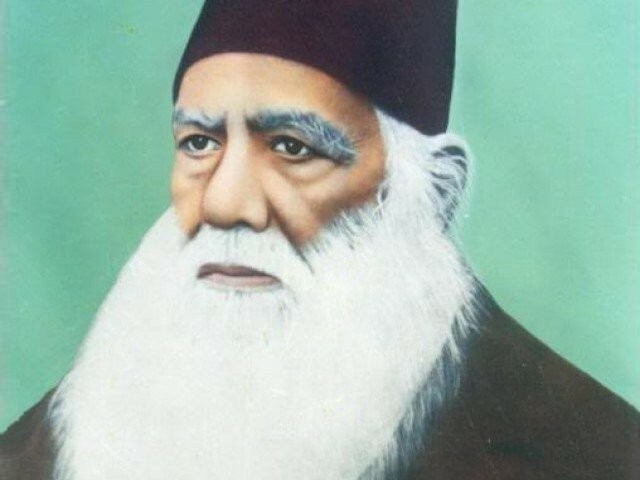 In the aftermath of the War of Independence of 1857, Sir Syed Ahmad Khan (1817-1898) emerged as a key leader of the Indian Muslim community, being a thoroughly modern Muslim in a thoroughly pre-modern age. He is credited for originating the Two Nation Theory, founding the Aligarh Movement and being a founding father of Pakistan. Less celebrated are his achievements in providing a modern, scientific and rational interpretation of Islam and the Holy Quran, as well as his debates on culture that – in the face of stern opposition from fundamentalists and detractors – sowed the seeds of enlightenment and progress. The year 2017-2018 is being celebrated as the centenary year of his birth in both India and Pakistan. Today marks Sir Syed’s 201st birth anniversary, and a fresh reading of his letter to students marks a fitting manner to remember the great man, who is unfortunately little read and largely misunderstood now. His writings in our textbooks are purely limited to the Two Nation Theory, his books on the ancient monuments of Delhi, and the causes of the 1857 War of Independence, namely Asaar-us-Sanadeed and Asbaab Baghavat-e-Hind, though he wrote a lot more on themes such as culture and civilisation, and was one of the earliest Muslim champions of interfaith understanding and peace, especially in his dealings with blasphemy. Similarly, his opponents and detractors misrepresent his secular and scientific thought, as well as the fact that like all great thinkers, Sir Syed’s thought also evolved throughout his long life. This letter forms part of the Mazameen-e-Sir Syed edited by Azizuddin Akhtar and published by the Muslim Educational Press, Aligarh (undated), and this is the only such collection of Sir Syed’s multiple essays this translator has seen where this letter has been published. Hence, the occasion marks the need for an original translation into English and a fresh re-reading. You have stepped into this destination of life, and I have passed many stages. I am descending from the spacious and blossoming hill of life with disappointed steps and an unfulfilled heart, having seen its wonders and curiosities once, and my greater sorrow is due to the reason that the tools nature had granted me while strolling on the hill of old age, I could not make proper use of them, owing to my ignorance and waywardness; there were gardens waving everywhere from the initial stage of the hill up to the high peak. The flowers of wishes and desires were blooming everywhere and without exception, the beautiful trees of hope could be seen bending down with pretty flowers at every destination, and a strange refreshing breeze could be seen giving freshness and cheer in everything and every place; in short, there were provisions of mirth and ecstasy. There was an open invitation for the traveller to use as he desired. There was no hindrance, to benefit from them was up to the intelligence and desire of the traveller, but alas! That I returned from this delightful destination, eyes closed. I kept believing the atmosphere and the spring would carry on like this, and this pleasant and delightful provision will not finish until the final part of the destination. But how wrong I was, now that I look upon the part of the destination travelled already, standing at the final spot of old age, I can retrieve nothing except regret and sorrow; an extremely extensive and exciting part of age has passed. When I look ahead, all the scenes appear to be a thorny valley and one views such a high ascent, to successfully negotiate what is an imaginary hope. The horrible visage of the scene ahead and the beauty of the already-travelled destination and the thoughts of having abandoned it without any credo distract my mind such that the remaining energy also appears to be lost. O dears! Why did I attain this disappointment, and why could I not take advantage of the world according to my wish? Only because I did not understand the value of time. During my early age when I could do something and establish a foundation for my welfare, I did nothing. Unfortunately, I did not find a leader or guide who could put me on the right path; I was not fortunate to have a patron or benefactor who could endeavour to turn my actions towards adequate determination. With my own control and intelligence, without any perfect guide or compass, I rowed my boat, so much so that upon my witnessing the limitless surface of the sea of existence after arriving at a dangerous rock, I saw the people who made use of wisdom and adherence to the rules and understood time to be an invaluable capital; how happy and fulfilled they are crossing the sea of existence, otherwise what could not have emphasised the flight of time and the need to benefit from it? But I, in my foolishness, did not understand its prodding. How great it would be if I restart the journey of life with this composition! The author is a Pakistani social scientist, book critic and translator. 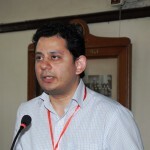 His translations of Saadat Hasan Manto have been re-translated in both Bengali and Tamil, and he received a prestigious Charles Wallace Trust Fellowship in 2014-2015 for his translation and interpretive work on Manto. He is presently working on a book of translations of Manto's progressive writings, tentatively titled Comrade Manto.